Join our F750/850GS Photos Gallery. Upload you pics, create albums, and easily embed the images into your posts ! 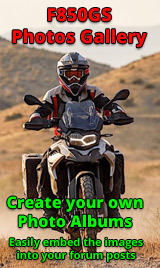 General chat relating to the BMW F750/850GS. Topics in this board must be F750/850GS related on subjects that are not covered in other boards. Modded your GS ? What changes have you made? What do you want to change? Tell us about what you've done (or want to do) here. 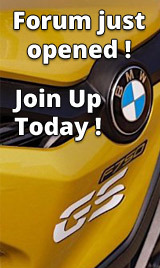 Discuss the maintenance and servicing of your GS. Chat about general bike related topics that do not fit in the other categories. Also discuss other BMW models here. Announce and discuss any forthcoming events, meetings, shows, or planned ride outs etc.